Gobble, Gobble! 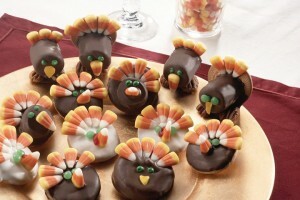 Turkey Cake Pops! 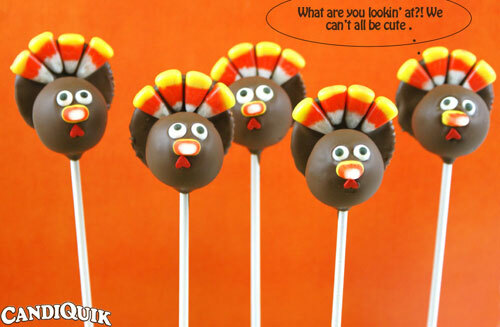 Who would’ve thought these little Turkey Cake Pops would be so popular!!? Ok, ok, so as soon as I made them and looked at their googly little eyes, big beak and candy corn tail – I knew. They just have so much personality! Each one of them. Whether they have a cute face or stink face. 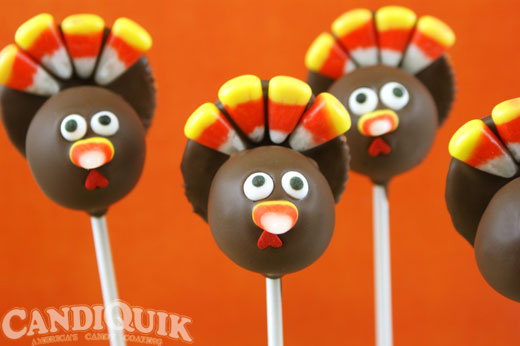 These turkey cake pops are perfect for an edible craft on Thanksgiving! Prepare and bake cake mix as directed on box. Crumble cake into a large bowl. Add frosting and mix thoroughly (it may be easier to use fingers to mix together). Chill for approximately 2 hours in the refrigerator (you can speed this up by placing in the freezer). 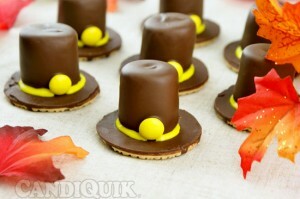 While cake mixture is chilling, prepare the “feathers” of the turkeys by gathering the candy corn and round crackers. Melt Chocolate CANDIQUIK according to the directions on package. Dip crackers in chocolate CANDIQUIK and place on wax paper. 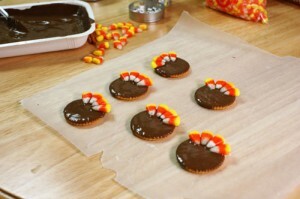 Before dry, attach 4 pieces of candy corn on the top edge of each cracker. Let dry. 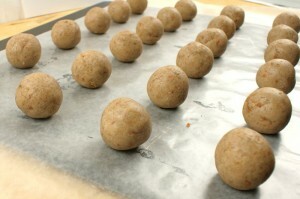 Roll cake mixture into 1” sized balls; place on a wax paper covered baking sheet. Insert a lollipop stick into each cake ball. Re-melt Chocolate CANDIQUIK for 15 seconds or until smooth again. Be careful not to overheat. 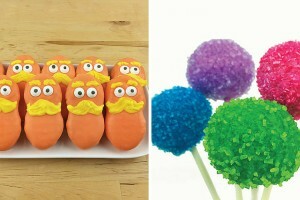 Press a candy corn on the center of the cake pop as the nose. You might need to hold it there for a few seconds so it doesn't fall over. Next, attach the 2 eye sprinkles. Before the cake pop is completely dry, press and hold a chocolate coated cracker against the back of the turkey's head until attached, this should only take about 15 seconds. 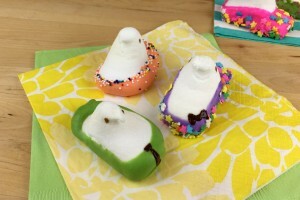 Place cake pop in the Styrofoam block to dry. TIP: If cake balls start to stick, get gooey, or fall of the stick when dipping, place remaining cake balls in the refrigerator for an additional 20-30 minutes. or without legs… your choice. P.S. 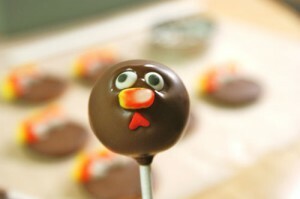 These Turkey Cake Pops were inspired by the Turkey Cookies I made a while back! 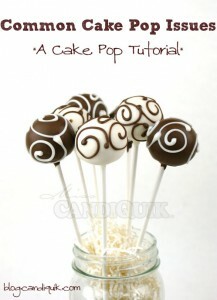 If you’ve never made cake pops, or had issues with cake pops, click HERE for my Cake Pop Tutorial! Thanks for sharing the process,just one question, does the ritz cracker get dipped twice, for the back of the tail? 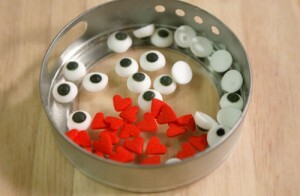 I would like to feature this in my next cakepops101 class, may I share your photos also? I will also be trying the Candiquik for the first time as I’m getting very frustrated with Wilton’s product. I need to know also How may cakepops can you get out of one package of your chocolate? Hi Kimberly! Thank you for the comment. 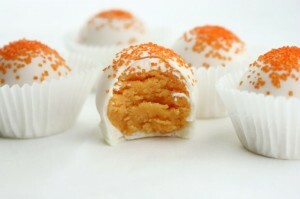 First off, 1 (16oz) package covers about 25 cake pops – give or take a few since everyone makes them different sizes. I would also dip the whole cracker in the coating – if you care about the back of the turkey being brown. If you’re doing that, just dip, let the excess run off and place on wax paper. Or you could always dip one side at a time – this may give it a cleaner look, because one side of the cracker won’t be pressed against the wax paper! Feel free to share my photos, giving credit please – and actually I will put the logo on all of these photos next week. This sounds so exciting! I would love to teach an *official* cake pop class! Let me know if you need ANY tips with Candiquik, as I have tons! Do you have any tips on the melting chocolate? 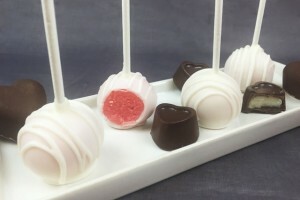 I’ve always had problems dipping the cake pops in the chocolate because of the chocolate not being thin enough to just dip right in even when following the package directions to a T. Any suggestion? Thanks! 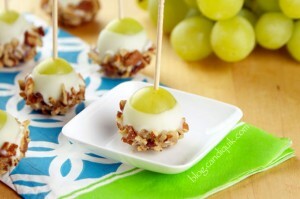 Oh and your Turkey Pops look amazing! Hi Brittany! This seems odd – sorry you are having issues! Couple tips: Add 1 spoonful (teaspoon-tablespoon depending on how thick) of vegetable oil or solid vegetable shortening to the melted coating, simply stir until it is well blended. This helps in humid climates – where the coating may be thicker because of the humidity. I’ve found the vegetable oil is easier to mix in. Also, try transfering the chocolate to a deep bowl, so that you can quickly dip the pop in without worrying about hitting the bottom of the tray. I didnt like doing the cracker so when I dipped the cakepop I put it down on it’s side on wax paper and it formed it’s own backing and then I just put the corn candy on it. It worked alot better and cut down alot of time. How far ahead can you make these? Hi Cathy! It is really undefined as to how far ahead you could make the cake pops – I would say, don’t let them sit around any longer than you would a normal cake. They are “sealed” by the chocolate though and you are definitely safe making them a few days in advance. Hope this helps! 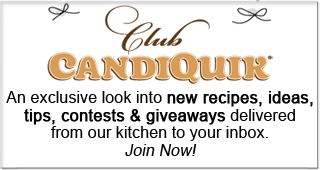 Where can you buy Chocolate CANDIQUIK® Coating? And where were you able to purchase the sprinkles? These are soooooo cute! I’d love to make them, but I’m not sure where I can purchase all the ingredients. Thanks Amelia! You can buy CandiQuik at many grocery stores across the US. If you provide me with a zip code that would help narrow it down! Otherwise, try your Walmart supercenter, Target, Kroger, Food Lion, Meijer, Brookshire Brothers…just to name a few. It can be found in the baking aisle. The sprinkles (hearts and eye-shaped) and lollipop sticks can be found at any local craft store, I found mine at Michael’s. Candy corn can most likely be found at your supermarket or any candy store. Hope this helps! Let me know which grocery stores are near you and I can help further with the Candiquik coating. My zip code is 30316! I’m so excited to try these! Thanks! Awesome! Looks like your closest supermarkets will be either Walmart supercenters, Piggly Wiggly, super Targets, or Food Lion (under the Food Lion brand). Good luck!!! 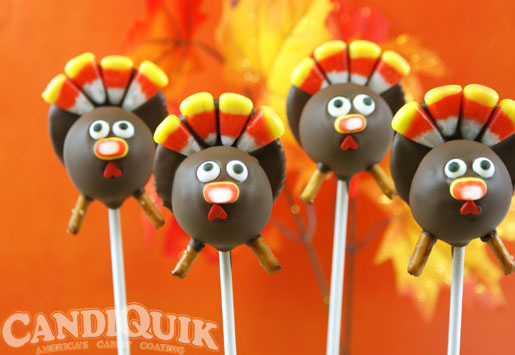 If you follow CandiQuik on facebook, feel free to share the photos if you make these turkey pops!! Happy (early) Thanksgiving! Ritz has out choclate covered crackers now, so you can skip a step. Also the chocolate covered Oreo’s work too. Absolutely! Any of these are options. However, not all grocery stores have the chocolate covered Ritz’s – but it would save you a few minutes! Do we have to use the microwave candiquick? Hi Tish, yes – you can melt CandiQuik Coatings in the microwave. Can you make the cake pops with the machine or does it have to be with frosting to hold better ? Hi Liz, you could certainly use the cake pop machine pops – they would work fine! I just prefer the hand-rolled ones because you can get them perfectly round, but either will get the job done and be delicious & adorable!